Broncs for Breakfast offers biscuits and gravy for breakfast and rank broncs for entertainment. Rapid City, SD-- “Ride as ride can be” is the first rule when participating in the Black Hills Stock Show® event, Broncs for Breakfast. The event will feature a ranch bronc ride and a biscuit and gravy breakfast at the James Kjerstad Event Center on Wednesday, January 30, 2019. Ranch bronc riding is different from the PRCA Saddle Bronc event in that all contestants will complete in a standard ranch stock saddle. Contestants have the option to grab hold with both hands as young horses will try to dismount the contestant. Points will be given to the most wild yet controlled ride. The event mimics the wild rides many regional ranch hands experience on a normal day of work. A total of 32 contestants will compete on Burch Rodeo horses in the long-go with the top eight advancing to the finals. A guaranteed purse of $6,000 will be awarded to the top contestants in the event. The event will be sanctioned with the Western States Ranch Rodeo Association (WSRRA) and competing members will have the chance to win points and money that will advance them to the World Finals in Las Vegas, NV. The event begins at 8:00am with biscuits and gravy, live cowboy music and a bloody-mary bar. 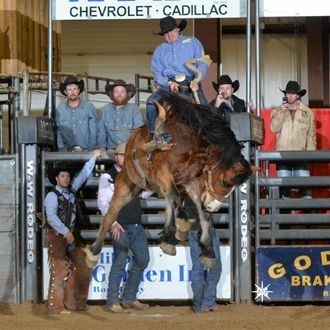 A Calcutta is slated for 9:30 a.m. with the wild bronc ride starting at 10:30 a.m.